Hayes & Yeading United produced a landmark result in their short history with a 2-1 victory at league leaders Oxford United despite being reduced to ten men for nearly half of the match. Garry Haylock’s men claimed a deserved half time lead and then defended doggedly throughout the second half to send the vast majority of the 5,045 crowd home disappointed. In truth, the first half was a dire affair as a spectacle and Oxford, who started in the ascendancy, found themselves unable to break down a solid back three of Tom Cadmore, Matt Ruby and Ed Harris. As the home fans grew frustrated with their inability to penetrate the visiting defence, Haylock’s men grew in confidence and began to enjoy longer spells of possession. However, they too were unable to create anything of note until the 25th minute. A Hayes & Yeading attack was broken down but Ruby collected the loose ball and sent a long throughball forwards. 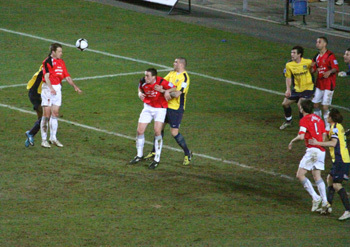 It looked to be too strong for United’s forwards to collect but the wind held it up and although Esmond James was in an offside position, the onrushing Craig Watkins collected the ball and prodded the ball in front of goal to Steve Basham who volleyed in against his old club via the base of the post (pictured right). The anticipated response from Oxford never really came to much and it was the visitors who came close to scoring again when from Clark Masters’ flat looking clearance, Basham played Watkins in but he couldn’t keep his shot down. However, United were to continue to press and before half time, they made it 2-0. A corner was forced and Adam Green floated the ball to the back post where Basham was able to nip in front of a group of players and power his header back across goal and in (pictured below). James was booked for preventing a free kick from being taken at the end of the half and this was to prove significant early in the second half. Oxford had signalled their intent at getting back into the game when Simon Clist fired narrowly over the bar after just 35 seconds of the restart following John Grant’s lay off. But only a minute later under more pressure, James tripped the oncoming Sam Deering on the edge of the area and a second yellow card followed by the statutory red reduced United’s numbers. Oxford scored soon afterwards when Cadmore headed an Ashley Cain cross in the air under pressure from Clist and the midfielder expertly volleyed the ball beyond Masters when it came back down. The hosts now had momentum well and truly in their favour. Damian Batt and Deering combined to set up Matt Green who turned and shot straight at Masters. However, apart from a few wayward long shots, the Hayes & Yeading team seemed to grow in confidence and belief that Oxford could be kept at bay. A swift break away involving substitutes Andrejs Štolcers and Daniel Wishart almost produced an unlikely third goal as the latter centred for Watkins who slid in at the back post but couldn’t get enough pace on his shot to trouble Ryan Clarke. A minute later, Oxford were breaking and Deering advanced towards the penalty area before unleashing a fierce shot which Masters saved at full stretch, before getting up quickly to block Grant’s follow up as well. Batt headed Jake Wright’s cross weakly straight at Masters but Oxford’s energy was on the wane and Hayes & Yeading almost scored again when following a foul on Wishart, Justin Cochrane curled a fine free kick towards the top corner, only to be denied by a great save from Clarke. 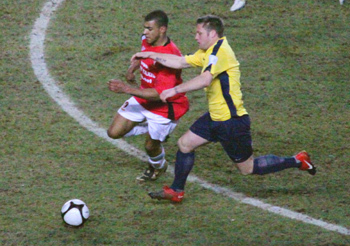 In the latter stages, Haylock’s team were almost undone by the single moment of hesitation in defence when both Cadmore and Ruby let the ball roll through to Grant but the forward’s progress was quickly scuppered by a brave Masters diving at his feet and coming up with the ball amidst penalty shouts from the supporters behind the goal. And when Wright’s shot from Chalmers’s long throw-in rose too high, several home fans left their seats for the exits, realising that this was Hayes & Yeading United’s night, with an against the odds but fully deserved victory. Report by Nick Bell. Photos by Ray Peploe. United Man of the Match: Matt Ruby.